Jellyfish I think are the weirdest of God’s creatures ever. They aren’t fish, they some completely different genus from shellfish, their transparent gloop-like elasticy of their bodies make them completely unique. There is no skeleton or rigid structural parts to their bodies, nor do they have any obvious things like eyes and mouth. The four ‘gland’ type things I can see I wonder is their brain, breathing, reproductive and digestion components? 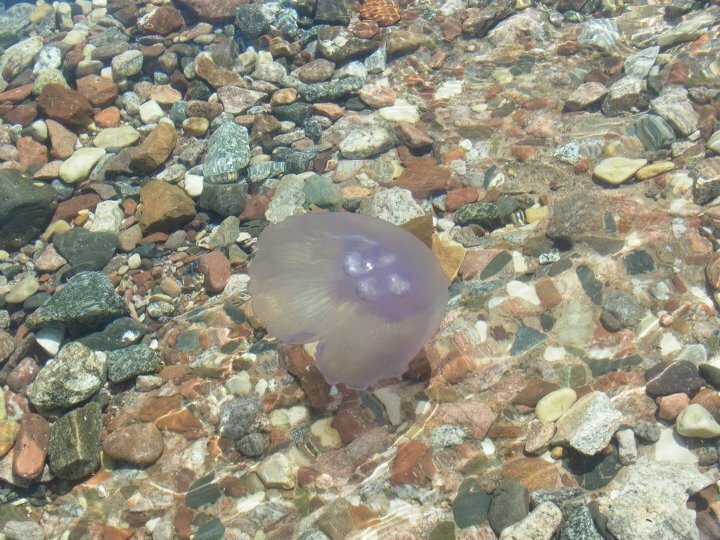 These ones are everywhere in Eilat, in the top of Red Sea, and they are purply colour. This adult one is about ten inches across, like a typical sized dinner plate. Apparently they do sting, but very mildly like a slightly unpleasant rash. These ones are more like inverted flowers rather than the long decorative tentacle draped lampshade-like ones people think of has been exotic and deadly. I had a fear of drowning as a child, combined with the evil swimming teacher woman from hell circa 1985 when I was about 9, in addition to not seeing now how my average 5’10” frame can propel in the surface of the sea without me getting into a panic of inhaling water. Yes – I have tried. But prefer to admire the sea no deeper than my knees which suits me fine. Before I got to see the incredible exotic fish here which rival the sort you would expect from being in the Caribbean or a Pacific Island, I didn’t get to visit the Marine aquarium this time, but the Jellyfish and serene stripey and mauve fish that are a complete world away from fish you see in Southern England are a real treat to see.